They say imitation is the greatest form of flattery. In fact, a recent study from the University of Tokyo found that copying others’ work (especially as it pertains to art) can make us more creative. For the time-crunched small business owner, this should come as good news, especially when the holidays roll around. If you’ve found yourself caught by surprise by the holidays and are now scrambling to pull together your holiday marketing campaigns, don’t fret! We’ve got you covered with these 10 examples of clever and creative holiday emails. ‘Tis the season for gift-giving, right? Everyone loves a freebie or a steep discount, so consider sending a limited-time offer to your recipients, like Configure.IT. In this example, Configure.IT offers its recipients a special coupon code for a whopping 50 percent off all subscriptions for an entire year. Note they also include a deadline for the coupon (December 31), so recipients are encouraged to act quickly to receive such a great deal. If you’re not in a position to provide steep discounts to customers, consider offering them a freebie of something low-to-little cost to you, like Prezi did with free, customizable templates. Trello cleverly puts its own spin on the “12 Days of Christmas” by outlining 12 ways Trello users can get the most out of the project management tool. They also include a clear CTA at the bottom (“Show Me How →”) that leads recipients to their online “How to” content. 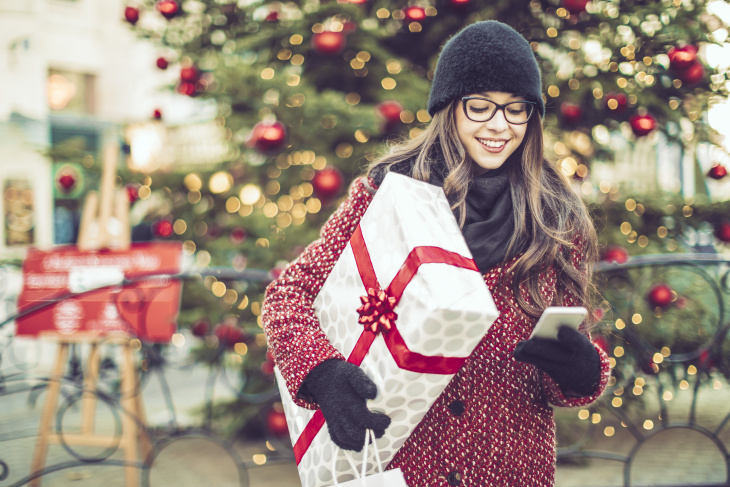 If your business has an ecommerce component, the holidays are probably a busy time of year for customer purchases. It’s also busy for the people purchasing from you. For customers with items left in their online shopping cart, consider a friendly nudge. Check out this example from Whisky Loot. In this email, the company takes the position of assuming the shopper is still making up their mind about whether or not to subscribe to their whiskey box subscription. They provide a list of perks that come with each subscription, and answer some frequently asked questions, with a clear CTA at the bottom to make finalizing the purchase easy. When we’re confronted with an urgent situation, we’re more likely to make a decision quickly. 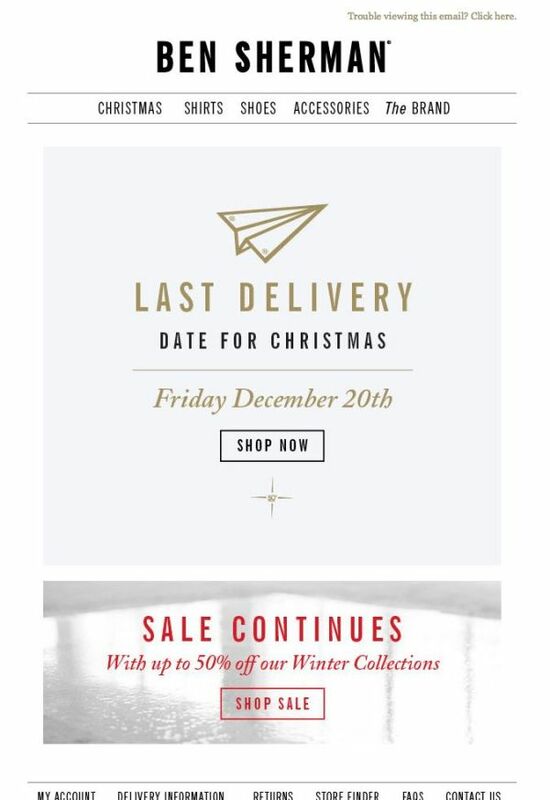 You can create a sense of urgency for your recipients by including a holiday countdown timer in your messages (like the J.Crew Factory Store), or list your final shipping and sales dates in order for purchases to be delivered in time for Christmas (like Ben Sherman). The closer you get to December 25, the higher the number of emails in your inbox climbs. But how many senders actually acknowledge this fact? The folks at Curate Labs did. In place of their monthly newsletter, they simply took a moment to wish their subscribers a Happy Winter Solstice and New Year. Sometimes, all your customers and prospects want this time of year is a simple greeting and a reminder they’re appreciated by you. The transition from Father Time to Baby New Year is an excellent time to reflect on the previous year and to thank your customers for their business. Check out Mutual of Omaha Retirement Plans Division’s email thanking their customers for their business. Not only did they keep their thank-you message short, sweet, and to the point, they didn’t use it as an opportunity to promote anything. They simply thanked their customers for their business over the past year and wished them well for the year ahead. Mobile app developer Readdle also took the approach of thanking its customers for their business but took it a step further by including an infographic of the past year. The infographic uses visuals of key user activity benchmarks, as well as company milestones during the past year. Finally, wooden Apple accessory manufacturer, Grovemade, used the holidays to give its email recipients a behind-the-scenes peek at the hand-crafted process its employees go through to create each product. Showing the people and the process behind their products makes the email more personable and interesting than a standard holiday promotion email. 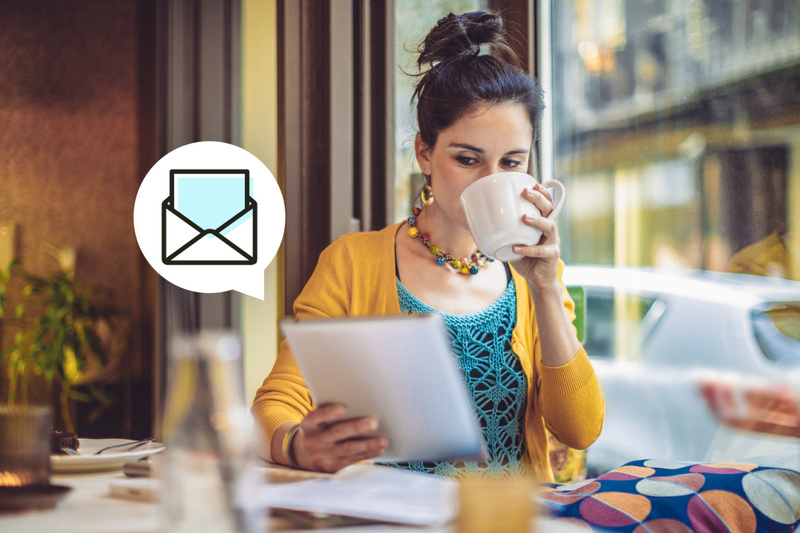 If any of these email ideas strike your fancy, great! But we’d be remiss if we didn’t remind you that plagiarism is not the same as imitation. Always use your own voice, messaging, branding, and imagery to keep your authentic touch to your emails. After all, it’s your personal touch people are drawn to, not somebody else’s. Sometimes, you just need a shortcut. Here are 10 sales-related email templates you can copy, paste, and use as a starting point for your messages to prospects.